Get everything you need for your Checks in one place, including Deposit Slips and Deposit Books, Window Envelopes, Deposit Stamps, Check Binders and more. As with our Checks, we will beat any price and most orders are ready to ship within 1 business day ! 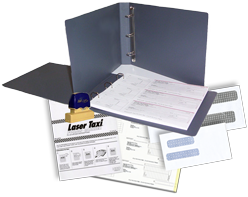 Keep your 3-Per-Page checks and deposit slips organized and safe in a business check binder. We carry a variety of accessories to bring order to your office, including these sturdy, stylish binders. They conveniently prevent desktop clutter and lost checks. Very reasonable prices and fast service. I had changed the type of check and was actually called to verify that it was correct!